There’s a Shaw promo right now offering its Internet 150 plan for $60 per month on contract, but it will require a two-year contract. 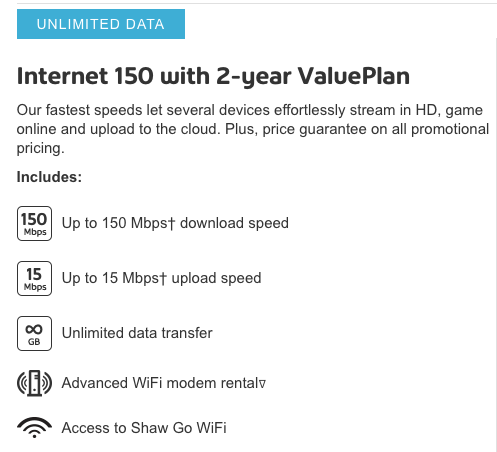 Currently, Shaw’s website only lists Internet 150 on a 2-year ValuePlan for $50 per month for the first six months. After the promo period, the price goes up to $95 per month for the remaining months. The plan offers download speeds of up to 150 Mbps and upload of up to 15 Mbps. With this $60/month promo, you save $630 over two years, versus current Internet 150 pricing (doesn’t include the $250 credit if you’re switching from Telus, but that probably pays for your cancellation fees). Also, if you’re a student, Shaw has ended its student pricing promo, but Telus still has theirs on until October 15, 2018. Shaw’s $10 referral program has also ended. 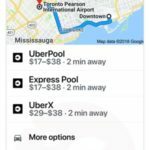 For those referring friends, it would net those sharing the service $10 in bill credits. If you’re looking for an Internet deal and you’re with Telus right now, it may be worth calling Shaw and speaking to their sales team. As for existing Shaw customers, you can try getting this deal or sweet talking your way to a better monthly plan. Back in July, Shaw launched Internet 300 speeds, offering promo pricing at $55 per month on contract, which is also currently still available but only for the first six months in a 2-year ValuePlan.